Do you need help to defeat an army of ants? Thanks to the cooler British climate, ants are not too much of a problem in this country – however when these small black critters make their way indoors they do so in numbers. During those brief months of summer when the sun breaks through and warms our streets and homes, ants can still be a problem. In fact, it would be unusual not to spot an army of ants at some point. What you don’t want though is those summer visitors to make their way inside, as once they have found a source of food and shelter ants can be difficult to get rid of. 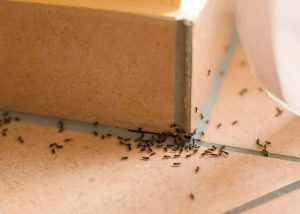 That tell tale sign of a line of black ants heading along the kitchen wall or into the conservatory is the first sign that action is needed. It’s not only kitchens that become an unintended home for ants though, they can also find their way into all other parts of the house as they hunt for food by squeezing through the tiniest spaces. And once they are in, ants are notoriously hard to get rid of as they leave a scent trail to encourage other ants to follow. As with all household pests, good hygiene is the best starting point to deter unwanted visitors. Be scrupulous when dealing with food waste, keeping crumbs off the floor and wiping up spillages while also maintaining a clean kitchen area. Part of the trick is keeping pests out in the first place by sealing any nooks and crannies that ants and other pests can squeeze through. Check doors are not cracked, windows are sealed properly and any broken brickwork or woodwork is fixed. Are ants a health hazard? Ants are not a health hazard in themselves, but they can cause health concerns if they have access to – and crawl over – a food supply due the risk of contamination. The ants that make their way into your house could have been anywhere and walked over anything, they could then transfer potentially harmful bacteria onto your food. With this in mind an ant invasion needs to be dealt with as soon as possible. Killing ants one by one is unlikely to solve the problem as more ants will continue to follow the trail. The area affected and their route into the house will need to be cleaned thoroughly to remove the trail. If you can, locate the nest and clean back to that point. There are DIY solutions on the market that act as ant deterrents, however, as with all household pest problems it is best to call in pest control experts who can deal with the problem safely and speedily. In the case of a large ant invasion professional help will certainly be necessary. For advice on dealing with ants contact Pest Busters.